"Enjoy Loud, Clear Calls and Easy to See Buttons"
The Clarity D704 Amplified Low Vision Big Button Cordless Phone- 40dB amplifies incoming sound up to 40 decibels and is 20 times louder than a standard home phone. 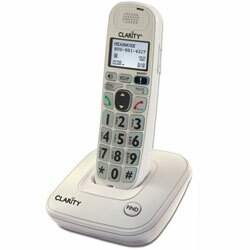 This phone amplification system offers DECT 6.0 technology and provides clear, interference free communication. Low vision features include the largest keypad of any cordless phone, hi-contrast numbers, a backlit keypad that is easy to see at night, bright visual ringer and a large font Caller ID display. The built-in digital answering machine allows messages to be listened to through either the handset or speakerphone.